TGM Associates, a New York, NY-based investment advisory firm with a single focus on multifamily properties, has announced a partnership with SoundWaters, a Stamford, CT-based environmental education organization focused on the protection of Long Island Sound and itswatershed. As part of the alliance, SoundWaters’ 80-foot schooner SoundWaters will be docked at TGM Anchor Point Marina in Stamford Harbor. The three-masted schooner is a teaching vessel used by SoundWaters to facilitate hands-on, science-infused learning experiences surrounding the ecology of Long Island Sound with programs for children and adults. 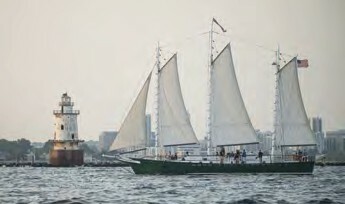 “The TGM pier and dock create an ideal home for the schooner SoundWaters, bringing the ship into the main Stamford Harbor for student learning and summer exploration for the entire community,” said Leigh Shemitz, President of SoundWaters. TGM Anchor Point Apartments and Marina runs along the west side of the west branch of Stamford River with its southernmost end bordering John J. Boccuzzi Park, where SoundWaters has key facilities. The 72-slip marina can accommodate boats up to 90 feet in length. Slips are available for hourly, daily, seasonal, and year-round rental. Residents of Anchor Point Apartments and seasonal slip holders have access to a resort-like amenity package with a 24-hour state-of-the-art athletic club, indoor basketball court, indoor racquetball court, café lounge with Apple computer bar and complimentary Wi-Fi, swimming pool, landscaped courtyards and multiple grilling areas. Shuttle transportation from the property to the Stamford train station is offered, providing convenient access to Manhattan and the Northeast corridor. For more information, visit www.tgmanchorpointmarina.com and www.soundwaters.org.